When we moved to Austin, Texas in 2009, the type of restaurant that we missed the most was a ramen-ya ("ramen shop"). Having spent well over a decade living in the San Francisco Bay Area, we had become spoiled by not only the availability of ramen, but also the quality and variety of ramen. Most people know ramen as the homemade instant noodle soup made from dried noodles and special powders that borrows the same name. However, real ramen is a truly satisfying, labor intensive, and difficult dish to make well. 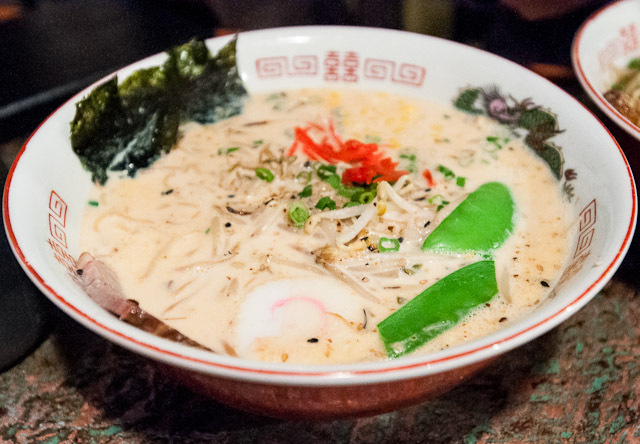 In the last year, ramen has finally arrived in Austin and it's not only good, it's great. If I were to describe ramen, I would break it down into three components: the noodles, the broth, and the toppings. The noodles are long and can come in a variety of thicknesses both thin and thick with either a square or circular cross section and can be straight or curly. My preference is for a medium thickness noodle which provides just the slightest bit of resistance to chewing similar to pasta cooked al dente. Thinner noodles can often lack texture (if overcooked) or be too chewy (if undercooked) because they tend to be cooked more uniformly. (A larger cross section means the exterior of the noodle can have a slightly different texture than the core. A thin noodle will cook through before any textural gradient can form.) Thicker noodles, even when cooked properly, often have just too much substance and can result in the ratio of noodles and broth being thrown off while eating. The most important aspect of the noodles isn't their shape. It's how they are made that differentiates them from other noodles. The ingredients are simple: flour, salt, water, and an alkaline solution called kansui. The alkaline solution (typically a mix of sodium carbonate and / or potassium carbonate) changes the texture, flavor, and color of the wheat flour in much the same way that alkali treated cornmeal (such as masa) no longer tastes or looks like regular cornmeal but becomes its own unique ingredient. Because of the alkali treatment, the noodles take on a yellow hue (not from eggs, as many would assume), have a pleasing, slightly alkaline flavor, and have a unique "bounce" to the chew. Making noodles is in itself an art form and few ramen-ya actually make their own, choosing instead to purchase fresh noodles from specialized ramen noodle makers. The broth is often the most complex component of ramen. There are several different kinds of broth generally made with some combination of chicken, pork, fish, seaweed, and vegetables. Many ramen have a light, almost clear broth such as shio ramen ("salty ramen") which is typically made with chicken and fish and cooked long enough to extract flavor from the meat and bones but not long enough to cloud the broth. Or, shoyu ramen ("soy sauce ramen") which is typically made with a chicken and vegetable broth seasoned liberally with Japanese soy sauce. These ramen are light and, even though they are hearty and served hot, quite refreshing. 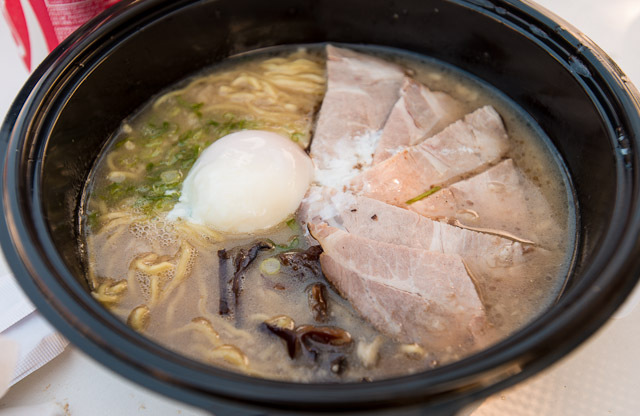 Tonkotsu ramen ("pork bone ramen") is an example of a richer and thicker broth which is made by boiling pork bones to extract as much flavor, fat, and gelatin from the bones as possible making an unctious, thick, white broth that is then seasoned for service. A well-made tonkotsu broth can take 24 hours or more of cooking in order to produce the rich and heavy broth that has a high probability of leaving the diner in a blissful food coma. Toppings for ramen are also widely varied including chashu (pork that has been rolled and braised at low temperature typically seasoned with honey and soy sauce), nori (roasted seaweed sheets), eggs (often poached [onsen tamago], marinated and soft boiled [ajitama], or hard boiled), kamaboko (fish cake), menma (marinated bamboo shoots), scallions, spinach, sweet corn, butter, bean sprouts, garlic, chili seasoning, mayu (sesame oil), beni shoga (pickled ginger), and more. 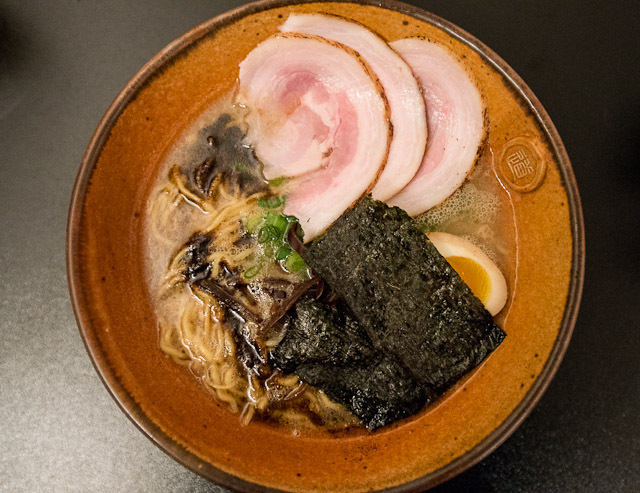 A lot of people would consider chashu the most important topping as it is the traditional protein served with ramen with many ramen-ya offering options to add additional chashu to the ramen to make it an even heartier meal. I could go on and on about ramen: the proper temperature the broth should be served at (it should be so hot that slurping, which incorporates cool air, is a necessity), the availability of kaedama (the option to purchase additional noodles after one has finished their noodles but still has broth remaining), the relatively recent popularity of miso ramen (and even more recent mala variant of spicy ramen)... but I should probably get on with the coverage of ramen in Austin. 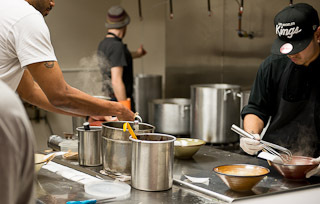 Our story of ramen in Austin began when we moved to Austin nearly four years ago. In California, we ate ramen every few weeks. Whenever we felt like it, we had a variety of styles to choose from with our favorite haunts being Ringerhut (for their Nagaski champon, a seafood ramen served in a starch thickened soup), Ramen Halu (for their rich tonkotsu ramen), Maruichi (for their kuro (black garlic) ramen), and, our all-time favorite, Santouka Ramen (for their spicy miso ramen). It was only natural that we would start to crave ramen while living in Austin and so the search for something passable (something that would satisfy our cravings) began. I started with Yelp and found a moderately well reviewed restaurant called Banzai that reportedly served ramen. The two ramens we tried were barely a step up from instant noodles with fresh ingredient toppings added (none of which reminded us of ramen toppings). We tried Musashino's ramen offering (a lunch time feature from this excellent sushi restaurant) where again the ramen was no good. Their biggest crime: instead of boiling pork bones so long the broth turns milky white, they simply added milk to the broth of their Hakata ramen (taking the "milky" description a little too literally). Their second biggest crime: ruining any chance of tasting the broth in their shoyu ramen by serving smoked beef brisket with it (and calling it "traditional" on the menu). We then tried Origami Sushi where a miso ramen was available on their dinner menu which was still no good. At this point, I began to alternate between complaining and pontificating about the need for a ramen-ya in Austin - a restaurant dedicated to the craft of making ramen. These Japanese restaurants adding ramen to their menus just to provide some variety for their guests simply wouldn't cut it. I told this to a waiter at Fino (who was considering starting a ramen business); I complained about the lack of ramen availability to my fellow restaurant critic panelists begging for suggestions and recommendations; I told as many Austin food bloggers that were willing to hear me talk about this noodle dish that had somehow become the one food item I missed the most. Alas, there was no ramen to be found. Over the years, we satisfied our itch by seeking out ramen whenever we could while on vacation in New York City (Ippudo - just above average ramen but very hip vibe), Chicago (Noodles by Takashi Yagihashi - a straightforward ramen that satisfies but isn't phenomenal), and the San Francisco Bay Area (Orenchi - amazing chashu and tonkotsu broth, Santouka, Ramen Dojo), but it would be nice to have some ramen closer to home. In November 2011, we paid a visit to Komé which had opened up the previous month and was serving ramen at lunch. At the time, Komé was serving the best ramen in Austin but it still left a lot to be desired (and not quite good enough for us to return). Desperate, we drove to Houston and tried six different ramens all around town in hopes that a mega-metropolis known for their Asian cuisine would have a satisfying ramen. Of the traditional ramens, we only found one which we could recommend (the shoyu ramen served at Kata Robata). Then a miracle happened. 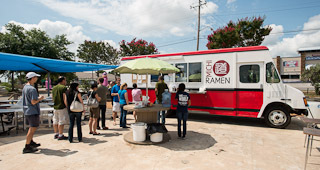 Michi Ramen opened their food truck for business serving fifty bowls of tokotsu ramen per service in North Austin around late April to early May 2012. We were in ramen bliss and even in the 100°F weather we would find time to make the trek up north to eat ramen. The tonkotsu ramen broth wasn't just good, it was great. One of the best examples of tokotsu broth we had tasted with richness that seemed like it was otherworldly. Unfortunately, eating a bowl of piping hot, super heavy noodle soup outdoors with only a thin mesh sheet hung over picnic tables and chairs to shield diners from the scorching Texas sun just wasn't the best situation over all. On June 17, 2012, Michi Ramen served their last bowl of ramen from their food truck and (having sold out every service and therefore certain there was ample demand for ramen) began their search for a brick and mortar restaurant. Once again, there was no ramen in Austin. A month passed and then a slow buzz started to build into a deafening roar which was impossible to ignore if you paid any attention to the food scene in Austin. The town's first ramen-ya was about to open and through excellent use of social media, everyone who bothered to seek them out could follow along on Facebook as Ramen Tatsu-ya painted their walls, designed their chairs and tables, experimented with side dishes, and teased the general public with "ramen shop coming soon" signs. 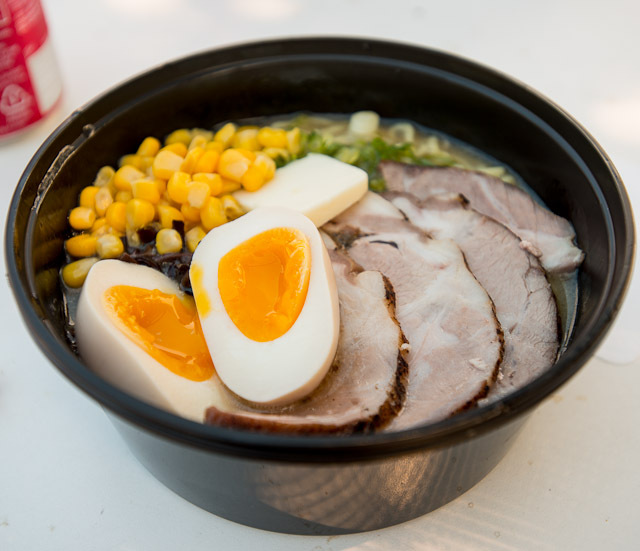 It seemed that everyone who missed Michi Ramen's short run as a food truck was now gearing up to hit Ramen Tatsu-ya as soon as it opened. On August 24, 2012, Ramen Tatsu-ya (8557 Research Blvd # 126, Austin, TX) opened for business and was immediately overwhelmed. For months, the reports from friends who lived closer to the ramen-ya came flooding in: "excellent broth"; "good but a little thin compared to Michi"; "lines are too long - waited 45 minutes"; "go at 9pm on Thursday". I didn't get a chance to try Ramen Tatsu-ya for myself until after Christmas 2012 when we showed up after 9pm on a Thursday (the place was packed and the line was almost extending out the door). 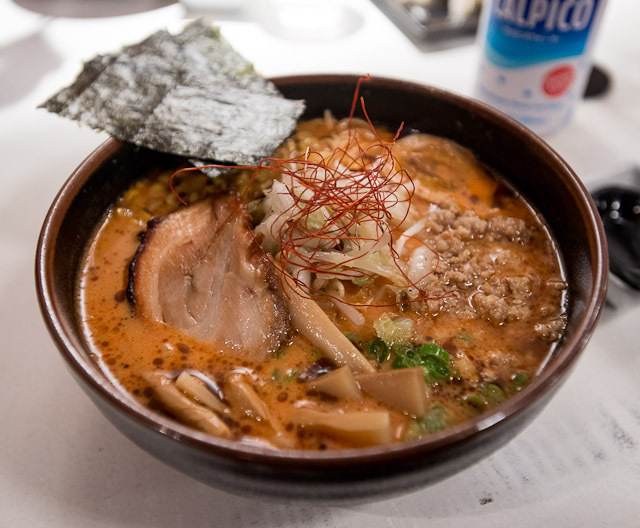 Ramen Tatsu-ya also allows you to easily customize your ramen with additions like the "spicy bomb" which makes your ramen spicy (but it doesn't just add heat, it also adds complex flavor some of which reminded us of the complexities of spicy Korean foods). If straight up chile pepper heat is what you're looking for, then "fire in a bowl bomb" adds the potent spiciness of habaneros to your broth. One of Tina's favorite toppings is the brussels sprouts (browned until nutty and slightly bitter) which adds yet another dimension to the noodle soup. We did find that the ramen overall was fairly salty on all three visits (and five bowls of ramen). By the third visit, we had learned the secret - order the ramen "less salty" and they provide you a small bowl of unsalted broth along with your ramen so you can adjust the saltiness of the broth without watering down the soup. Tsukemen (dipping style ramen), where thick ramen noodles are provided with a heavy broth (more concentrated than their regular ramen broth) to be eaten by dipping the noodles into the sauce and eating the noodles without soup, is also available. Overall, Ramen Tatsu-ya is pushing out some excellent ramen with wonderful toppings as their greatest achievement and an impressive broth. 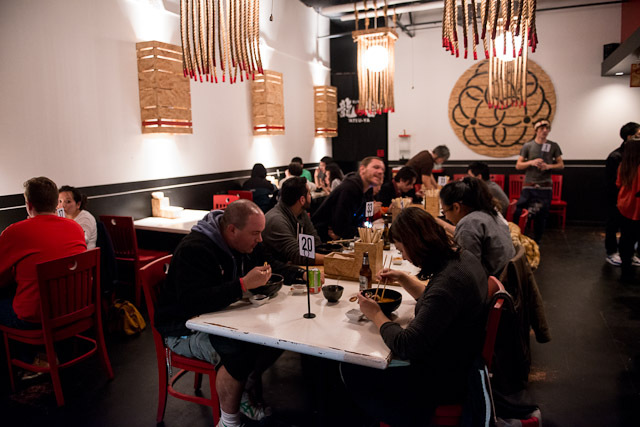 Seating is fairly limited at Ramen Tatsu-ya, which might contribute to their long lines. Most of the tables are "community" tables where the people dining next to you could be strangers (allowing for a bonding opportunity with other Austinites who love ramen). There are a few tables against the wall where a couple could sit by themselves, but at really busy times, you might be asked if you would mind joining another couple willing to share their table. (You can, of course, refuse and wait for the next available table while the next group in line gets the opportunity to sit with strangers.) One last comment about their space is that either due to poor ventilation or the size of their kitchen and dining areas, the smell of charring chashu permeates the air. It's a wonderful smokey and savory smell that gets your saliva going as you stand in line and brings wonderful and pleasant thoughts to mind... but lingers on your clothes and hair until you wash them. Seven months after serving their last bowl of ramen from the food truck, Michi Ramen (6519 North Lamar Boulevard, Austin, TX) opened the doors to their restaurant and started their soft opening. I ate there three times in their first 13 days and could not be happier that they had maintained the quality of their superb broth. Since a food coma inducing super rich and hearty broth isn't for everyone, Michi Ramen offers three different levels of richness: stout (their richest full-bodied broth that is most similar to what was served at the food truck), regular (a rich broth), and light (a full flavored but less fatty broth). I plan on making a trip to eat both Michi Ramen and Ramen Tatsu-ya on the same night so I can properly compare the broths, but, making a judgement based on my taste memory, I would place Ramen Tatsu-ya's broth richness somewhere between Michi Ramen's regular and light. When they opened, Michi Ramen served a low temperature braised rolled pork belly (very traditional), but I found that that particular execution of that particular method of preparation for that particular cut in Michi Ramen's ultra-rich broth to not work as well as it should have. Michi Ramen has since switched to the pork shoulder chashu which they prepared during the summer and served at their food truck which I feel works decently well. It sounds like they're working on perfecting their pork belly recipe and might offer it as option on their menu in the future. (Pictured here in the Michi Ramen bowl is the pork belly from their very first night.) 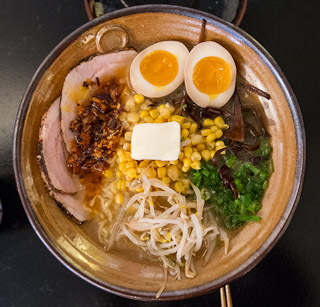 The noodles are made for Michi Ramen by a popular ramen noodle company in California who provides for many of the top notch ramen-ya on the West Coast and is flown in fresh. The texture, thickness, springiness, and flavor are just right (probably since I love West Coast ramen so much). Sapporo Ramen (named after the city where miso ramen was first known to be served) has the tonkotsu broth with sweet miso paste, butter, corn, and bean sprouts. We really enjoyed the balance of the miso with the stout broth when we had it during the summer, but when we tried it with the light broth found it a little overpowering. It could have been that the kitchen was a tad heavy handed that night with our miso or that the miso just works better in the richer and fattier soup bases. 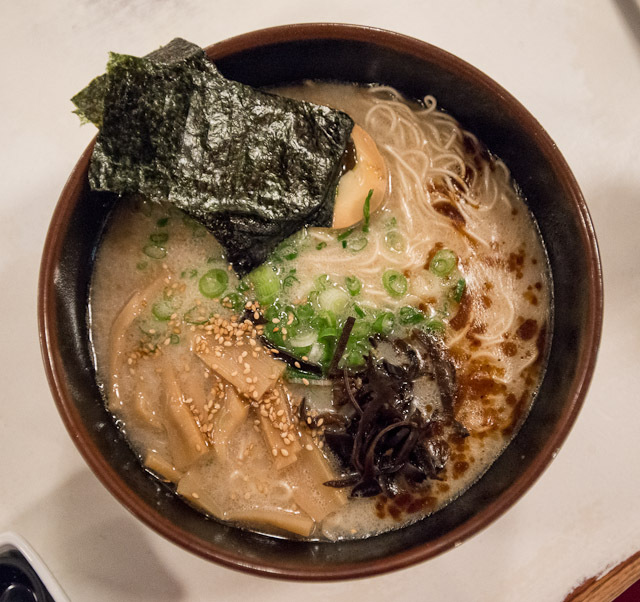 Michi Ramen also has a vegetarian soup and allows you to fully customize your ramen by choosing the noodles and broth option and adding any toppings you might want. Michi Ramen has a much larger space than Ramen Tatsu-ya and service (other than the very first night where I had to wait an acceptable 20 minutes for my food) is fast, helpful, and attentive. While Ramen Tatsu-ya is counter service (order food at the counter, pay up front, sit, they bring you the food, and leave whenever you are ready), Michi Ramen is a standard sit down restaurant where you get seated, order from a waiter from a menu, eat, and pay on a fancy tablet that gives you the option to email or print a receipt (if only all places provided the email option! OfficeMax also emails receipts and I'm growing to like the option). Another difference is that Michi Ramen's space is large enough that tables aren't crammed together and there's no chance of being bumped. However, decorations are sparse and it's clear they are running on a budget with all their focus being poured into their food. Ramen Tatsu-ya has Michi Ramen clearly beated when it comes to atmosphere (which is very carefully manufactured from the large wall dominating artwork, painstakingly handmade sconces, and distressed tables; everything is designed to make you feel like you stepped into a well-weathered ramen-ya forgetting that you are in Central Texas). Michi Ramen looks like it could be a Chinese restaurant (not the ones with artwork everywhere and paneled walls, but the kind that takes over a space and improves it just enough for it to be servicable. 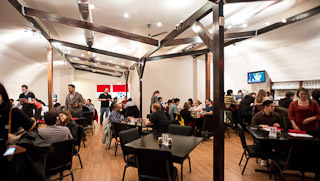 For Austinites, think of the interior of Asia Cafe or A+A Sichuan Restaurant). All this will, hopefully, improve over time as soft opening transitions into regular service and more resources can be devoted to the interior. I, for one, am glad that they chose to open as soon as possible as I cannot get enough of their killer tonkotsu broth. Since I'm talking about the inside of the restaurant, I thought I'd mention that everytime I've dined there I haven't felt like I needed to wash my clothes or take a shower to feel and smell clean. I'm not a person that puts heavy emphasis on decorations, so the fact that I don't have to queue up and decide what to order before I get to the counter, can sit at my own table, and spread out (I often carry a large camera bag and at Ramen Tatsu-ya had to eat with the bag in my lap two out of three visits) really helps me to relax and enjoy the food. 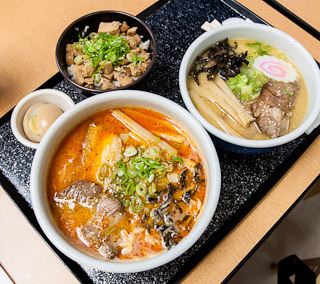 When Michi Ramen opened, they served both lunch and dinner for 7 days a week. They soon removed Mondays to provide some additional time for prep and to allow them time to make adjustments and changes as they saw the demand and feedback come pouring in. This last week, they removed (temporarily, I'm told) lunch service to focus primarily on dinner service because the previous weekend they had run out of food by 7:30pm. Turning away customers is never a good thing, but having a ramen so good that they run out of food has to be proof they're doing something right. Focusing on dinner service only will give them a chance to figure out how to meet the demand without any unhappy customers. Their plan is to bring back lunch service in the future and eventually return to 7-days a week. Both Ramen Tatsu-ya and Michi Ramen are wonderful examples of ramen and definitely worth a visit from those interested in tasting real ramen for the first time as well as those, like me, who are addicted to ramen and need to satisfy their cravings. They each have their strengths and execute those strengths at a world class level (Ramen Tatsu-ya's chashu and Michi Ramen's tonkotsu broth) and both worthy of patronage. Rumor is that this spring the team over at Komé is opening their own ramen-ya called Daruma Ramen in downtown on East 6th Street. Hopefully, with a dedicated kitchen focused on making ramen, they'll be able to elevate their dish to a similar level as Michi Ramen and Ramen Tatsu-ya. Then, in less than twelve months, Austin would have gone from none to three noteworthy ramen houses - enough to rival any city in the United States. Fantastic write-up! I've yet to get to Michi, and the discontinuation of their lunch service is going to make it even more difficult. I've GOT to get there soon, though. Also, I can't believe Tatsu-ya's broth is between regular and light at Michi! Michi's stout must be REALLY rich. You have to try the new East Side Kings brick and mortar at the Hole in the Wall on the drag. Their ramen has delighted me thus far, including their beer bacon and a special kimchi version (not quite as delish). I'm no ramen conosiour (I prefer me some pho), but I've found that a lunchtime stop at this locale is worth it every time. I, too, am a ramen lover and have done many write-ups on our options in Austin. Michi broke my heart when they closed last summer. I was forced to try my hand at making my own ramen to get my fix. It gave me an increased appreciation for the complexities and endless variables to getting it right. I did not get it right, by the way. I didn't expect perfection on my first attempt, but I suspect it may just take a lifetime to truly master. I'm glad for Michi and Tatsu-ya. Now I don't have to try. I love Paul Qui, so it pains me greatly to say that the only time I've been to East Side King Hole in the Wall it was extremely underwhelming for me. My noodles were overcooked and super soft and mushy (no springiness whatsoever) and the broths just didn't work for me with too many dominating flavors (super salty, tasted like powdered spices, and in the tortilla soup overly strong lemongrass and keffir lime leaves) that weren't melding / blending. The eggs were phenomenal and the soft tofu served with the kimchee ramen was great. However, I honestly preferred the texture and flavor of the instant noodles they served at The Grackle and also preferred the broth there. In either case, it's not really a fair comparison with the other ramen-ya in town since it's mostly just ramen in name. I'll visit again some time as it is possible that I hit them on a bad night. Honestly, Ramen Tatsuya is far superior to any other ramen on the list. I know it's nice to group together all of Austin's ramen places and say they're good (and they are), but Tatsuya's ramen is on a different level. It's not something you can replicate at home, unless you have no life. The rest are just tugging on the coattails of Austin's ramen craze. Honestly, Ramen Tatsuya is far superior to any other ramen on the list. List? There's only two ramen places covered here - Tatsuya and Michi. Michi's stout is the best broth in town without question (I would say that Tatsuya's tonkotsu is better than Michi's regular and light broths, but you don't shouldn't go to Michi and order anything except the stout) and Tatsuya's toppings are stellar. I know it's nice to group together all of Austin's ramen places and say they're good (and they are), but Tatsuya's ramen is on a different level. I'm not sure you read the article... guessing you just read the title and then commented? I'm pretty sure I never say all the ramen in Austin is "good" and they aren't. There's only two worth eating at.